As well as the basic design of a 3 man tent, the geometry and the material play an important role in terms of its intended use. The following is an overview of 3 man tents. A tunnel tent guarantees the best usable space to weight ratio and is also quick and easy to assemble, since the inner and outer tent are usually attached to one another (inner tent is suspended). The most common tent design is the dome tent. In contrast to tunnel tents, dome tents are capable of standing independently. The use of fewer pole arches saves weight. Moreover, the crossed pole system provides good stability. Inner and outer tent are usually pitched separately. The advantage in this case is that, when temperatures are mild, you can use the inner tent on its own as a mosquito net. 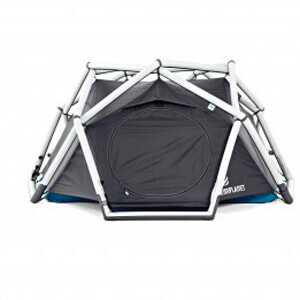 The third 3 person tent option is the geodesic design. This design looks like a dome with the pole arches overlapping multiple times on the outside. The outer tent is effectively divided into smaller areas. The subsequent dramatic increase in stability makes geodesic tents particularly suitable for use under extreme weather conditions (strong wind, storms). Generally speaking: The use of a 3 man tent with an external pole system is recommendable under unpredictable weather conditions (if pitched in the rain, the inner tent will remain dry!). The separation of the inner and outer tent allows you to adapt to the weather conditions perfectly, particularly in the summer. You can expect a 60 cm wide sleeping area for each person in most 3 person tents. Make sure you take your personal height and space requirements into consideration when buying a 3 man tent. It is also important to consider if you want/need to keep your equipment inside (security and quick access/sub-zero temperatures). Whether or not it is possible will depend on the design of the vestibules (lightweight 3 man tents may not have enough space for several large trekking backpacks under the awning). Air circulation is important in a 3 person tent, especially when it is fully occupied. More than one entrance is a good solution. All of our 3 man tents are permanently waterproof thanks to special coatings. If you're planning on camping in sub-zero temperatures, you should go for a silicone coating. Silicone remains non-porous even when subjected to extreme temperature fluctuations.